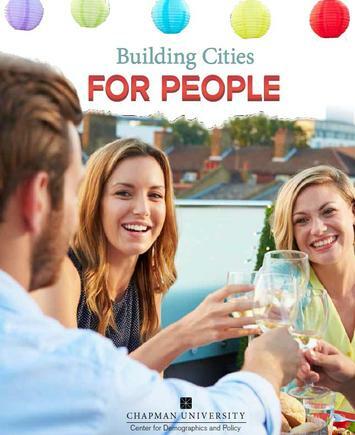 This is the introduction to a new report: “Building Cities for People” published by the Center for Demographics and Policy. The report was authored by Joel Kotkin with help from Wendell Cox, Mark Schill, and Ali Modarres. Download the full report (pdf) here. Cities succeed by making life better for the vast majority of their citizens. This requires less of a focus on grand theories, architecture or being fashionable, and more on what occurs on the ground level. “Everyday life,” observed the French historian Fernand Braudel, “consists of the little things one hardly notices in time and space.” Braudel’s work focused on people who lived normal lives; they worried about feeding and housing their families, keeping warm, and making a livelihood. Adapting Braudel’s approach to the modern day, we concentrate on how families make the pragmatic decisions that determine where they choose to locate. To construct this new, family- centric model, we have employed various tools: historical reasoning, Census Bureau data, market data and economic statistics, as well as surveys of potential and actual home-buyers. New York, San Francisco, and Los Angeles long have been among the cities that defined the American urban experience. But today, families with children seem to be settling instead in small, relatively inexpensive metropolitan areas, such as Fayetteville in Arkansas and Missouri; Cape Coral and Melbourne in Florida; Columbia, South Carolina; Colorado Springs; and Boise. They are also moving to less celebrated middle-sized metropolitan areas, such as Austin, Raleigh, San Antonio and Atlanta. Traditional cities will continue to attract many of our brightest and most capable citizens, particularly among the young and childless. But our evidence indicates strongly that, for the most part, families today are heading away from the most elite, celebrated cities, and towards less expensive cities and the suburban periphery. Download the full report (pdf).